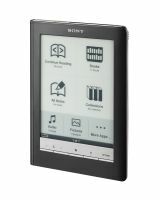 Enter the drawing to win a Kindle2 or a Sony eReader Touch! If you've been waiting to get your hands on an ebook reader, wait no more! 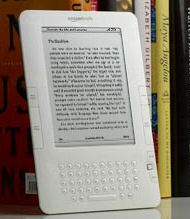 Writerspace is giving away your choice of a brand new Kindle2 or Sony Touch eReader to one lucky reader! Just register below to enter. Amazon's Kindle2 lets you download books anytime, anywhere in less than 60 seconds; no PC required. With over 240,000 books plus U.S. and international newspapers, magazines, and blogs available, you're just seconds away from a great read. The Sony eReader Touch EditionTM lets you access up to 350 (or more with memory expansion card slots) of your favorite books from anywhere. The intuitive 6" touchscreen display makes navigation a breeze, letting you turn pages with the swipe of a finger. An included stylus offers freehand highlighting and annotation. With support for multiple file formats including ePub and PDF, you can enjoy books from more places, including The eBook Store from Sony and over one million free public domain titles from Google Books. Contest runs from September 1 through November 30. Winner will be notified December 1, 2009. One contest entry per contest per month. Entering the contest grants us permission to list your name as our winner and to add you to the Writerspace mailing list. If you are a registered Writerspace.com user, log in to enter the drawing. Yes, please keep me updated on contests and special events for other romance writers as well as information on new releases, live chats with published authors, and new forums and resources for readers and writers. Uncheck if you do not wish to receive Writerspace News. Don't have a Writerspace.com login? Just click Register below.